Greatly improves the grip and traction of the tires as the unit is propelled through the snow. Ask us about the Ariens Tire Chain Set 15" Tires. Please no repair questions. Your Q&A may be posted to SnowblowersAtJacks.com to help other shoppers, like you, with their purchasing decisions. Thank you. I need tire chains for my Ariens compact 24 15 x 5 tires. Are these the correct ones? 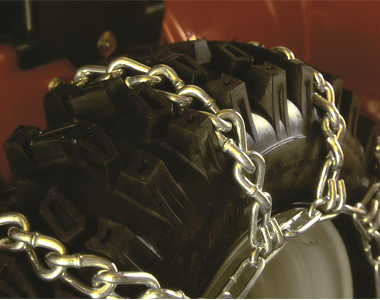 Joe, yes Ariens 72101600 tire chains are compatible with the Ariens Compact 15" x 5" tires. John, these chains will fit your tires.